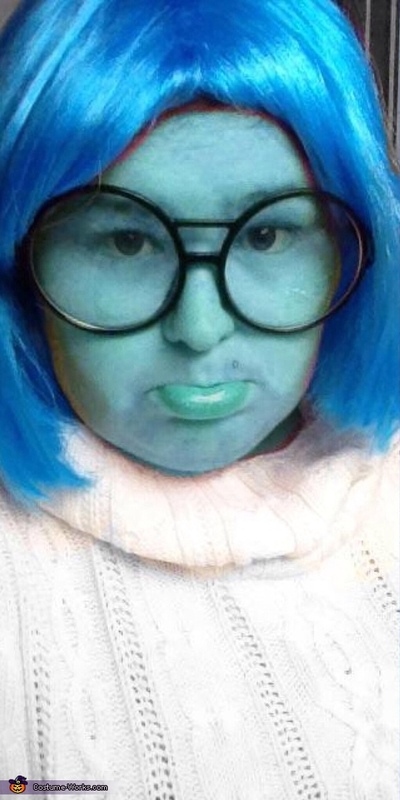 I am wearing this costume that I created to look like Sadness from Inside Out. I pieced together this outfit with some things from my closet(navy blue pants and shoes), a sweater I bought at Goodwill, 'nerd glasses' from Spirit Halloween, and blue eyeshadow/lipstick for the skin color and lip color. I loved Sadness from Inside Out, because her character matched my body type and height perfectly.